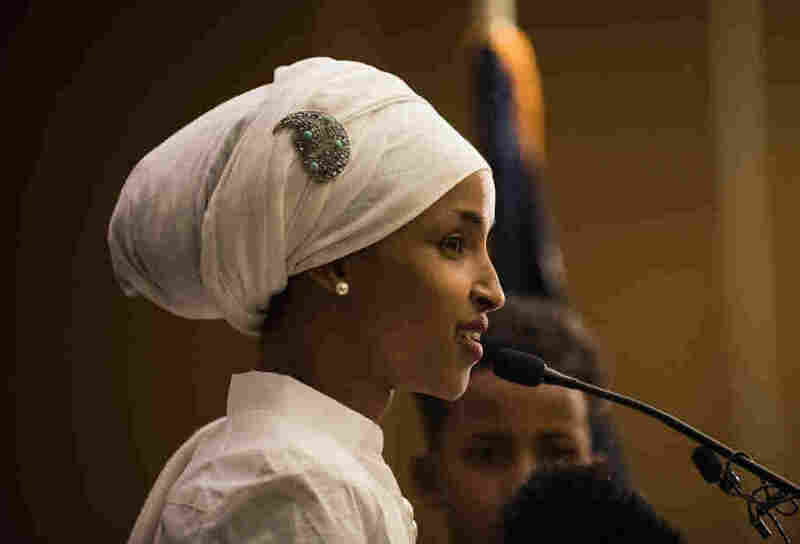 Former Refugee Ilhan Omar Makes History By Becoming First Somali-American Legislator : Goats and Soda On Tuesday, 34-year-old Ilhan Omar became the first Somali-American lawmaker in the United States, winning a seat in the Minnesota House. She's a former refugee, a Muslim, a mom of three, and now the first Somali-American lawmaker in the United States. "This really was a victory for that 8-year-old in that refugee camp," Ilhan Omar, 34, said. "This was a victory for the young woman being forced into child marriage. This was a victory for every person that's been told they have limits on their dreams." "I think I bring the voice of young people," Omar said. "I think I bring the voice of women in the East African community. I bring the voice of Muslims. I bring the voice of young mothers looking for opportunities." She won House District 60B in southeast Minneapolis with 80 percent of the vote. It wasn't a surprise that Omar would win a Minnesota House seat in the reliably Democratic district: In the primary contest earlier, she beat a 22-term incumbent, and her Republican challenger suspended his campaign for family reasons. Allegations were raised during the campaign that she had illegally married her brother to commit immigration fraud; she denied the charge. "Minneapolis said no tonight, said no to hatred," Habon Abdulle said. She's the executive director of the Minneapolis group Women Organizing Women Network. "Minneapolis said no to the narrative of making America hate again. Minneapolis tonight said yes to diversity. Minneapolis, and [the] 60B district particularly, you said Muslim women have space in the governing body of our state. Thank you." When Omar's husband took the microphone, he got the crowd laughing when he started to describe strong, black, Muslim women. "For those men — wooo! — let me tell you something," Hirsi said. "When you see a strong, African, Muslim woman, don't be afraid, no, you know what, appreciate that. That's the model, that's the new 2016, going into 2017." Omar and her children joined him on stage as the crowd started to chant, "Ilhan, Ilhan, Ilhan." "Our campaign has been about more than just uniting a district, more than winning back the House, more than making history," Omar said. "Our campaign has been about shifting narratives, restoring hope and re-establishing access in our democracy." "And we will never stop fighting for a democracy that works for all of us, for a prosperous and equitable Minnesota that we will all be proud of," she said. "I will never give up fighting for you, and I hope you will never give up fighting for me." Omar's mentor and friend, Minneapolis City Council member Andrew Johnson, said he knew long ago that she would make history. "I had no doubt that Ilhan would get here. The big question is: What's the path an individual takes?" Johnson said. "And I just think she's just naturally a great leader." Mohamed Omar Giama couldn't agree more. The 90-year-old former Somali ambassador to the European Commission said he was overjoyed witnessing history. "I never thought a Somali lady, a refugee, can get through all this hardship and difficulties to get elected to Minnesota parliament," said Giama, who attended her victory party. "It's wonderful," he said, "just wonderful." A previous version of this story incorrectly said Ilhan Omar's family came to the U.S. in 1997. The family actually came in 1995.